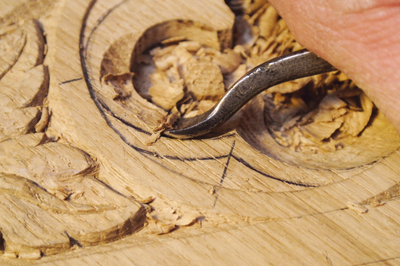 Most carvers call them by their common name of spoon or short-bent gouges, but in a carver's workshop they are called tracery chisels and I would like to explain their original use in the tradition of woodcarving. 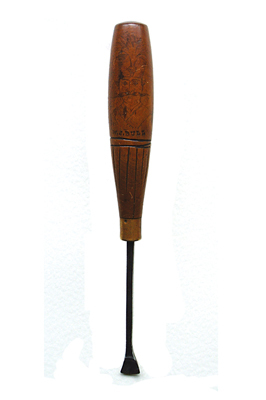 The purpose of this tool as its correct name implies is to carve tracery work. Tracery evolved from the pointed stone arches called lancet windows in the style of architecture known as Gothic. 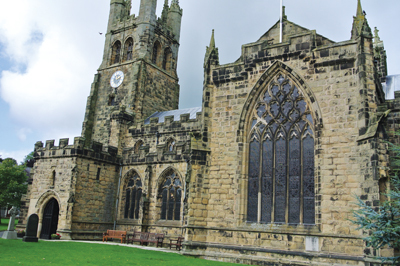 Stonemasons embellished the area between two or more windows at the top of the stone arches and rose windows with designs including trefoils and quatrefoils which had the desired effect of minimising the weight of stone without compromising its strength. 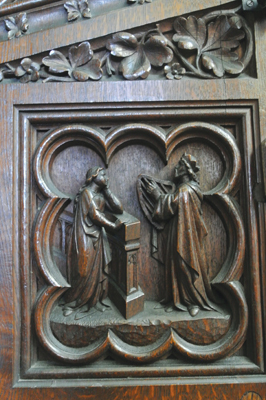 The woodworkers were obliged to copy the stonemasonsâ€™ design on internal objects as a continuation of the Gothic style. The tracery tools used to form these features in wood when viewed from the side have a tight hook shape and form part of a sphere at the bottom of the shaft - sometimes called the bowl - that usually includes a uniform radius to the cutting edge. They are only sharpened on the outside of the cutting edge and should incorporate a curved bevel so the outer ball shape runs into the cutting edge and forms part of a sphere, allowing it to enter and exit the wood with ease. If a heel is included with the bevel then the effectiveness of the tool is reduced because it does not present a continuous curve to the back of the chisel. 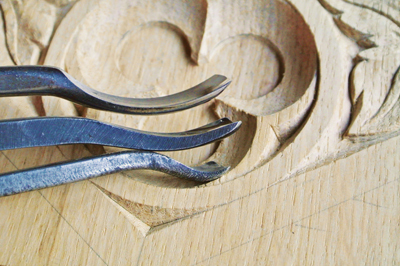 The overall shape of the tool, when seen from the top, flares out towards the cutting edge similar to a fish-tail chisel and minimises the chisel from binding in the wood as it cuts. Modern fish tails are more like spades today but that's another 'soap box' moment! Incorporating a curved cutting edge - 'bull nosed' - further enhances its efficiency by allowing the bottom of the cutting edge to be forward of the corners and therefore cuts first around an inner curve. All these characteristics including the hook shape allow you to cut a hollow form that flows around an inner curve typically found in tracery features. You cannot successfully execute tracery work without traditional tracery chisels and of course if the chisel can cut a tight inner curve, it can certainly create a long curve so they are far more versatile. Instead of the tight hook shape, many manufacturers have decided to incorporate a more moderate, longer, flatter curve to their chisels, echoing the shape of salmon-bend chisels; I can only assume this is because they are easier to manufacture. This restricts their usefulness for reproducing tracery elements as they can only cut hollows on convex curves that have larger radii due to their flatter curve. These are useless to a carver who needs to replicate tracery details that include tight radius curves, for example. 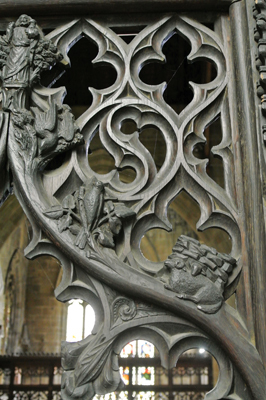 It was the tradition in larger workshops that tracery work would be delegated to a few joiners who may be interested in entering the carver's domain. From a carver's perspective, this would be appreciated as the precision of this type of feature is suited to a joiner. They would be titled 'tracery hands' and for this reason would have a few carving chisels in their tool kits appropriate for this work. 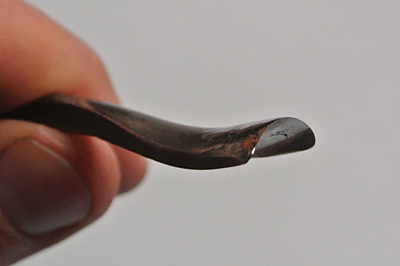 The term 'spoon', as mentioned, is the common name used for this type of chisel; we must assume it derives from the general shape of the chisel echoing the piece of cutlery with which you stir your tea or coffee. To save time in the olden days you had your rest periods at your workbench and this was the tool's secondary use - I have witnessed it. If you needed more sugar in your mug of tea all you required was a larger tracery tool; perhaps these should have been called dessert spoons! Like tracery chisels these are used for creating tracery features producing a convex form - roll or bead, technically called an astragal - on the inside of an internal curved surface. Similar to the tracery chisels the curved hook at the bottom of the shank should be short and tight to allow the tool to be effective. They are only sharpened on the convex surface of the cutting edge - outside the cutting edge - with the concave - inner - surface being a uniform constant curve. Traditional joiners tend to use these tools to create similar architectural features as carvers but for 'part time' carvers they are seldom required.